According to The Hollywood Reporter, Jessie Usher (Survivor's Remorse) will play the son of Will Smith's Captain Steven Hiller — presumably the actual son and not his wife's kid from the movie all grown up. It'll be interesting to see them establish the relationship since Will Smith won't be returning. Hemsworth's character hasn't been named, but rumors have him pegged as the nephew of Bill Pullman's president character. There is absolutely no confirmation of that, but I can totally see a familial resemblance between the two. Let's get ready for him to make a big ol' speech, if it's true. Pullman's return is itself still up in the air, but at least one star's isn't anymore. It's been reported — and confirmed by Roland Emmerich on Facebook — that Jeff Goldblum will be back as David Levinson. No word on whether he'll be infecting anymore spaceships with viruses, but, as always, we're betting on Goldblum being entertaining. 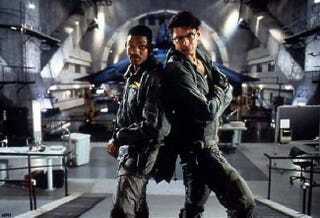 So that's the Will Smith, Bill Pullman, and Jeff Goldblum characters — by return or by proxy — taken care of. It's slightly weird that we're getting all these new relatives and not the ready-made ones from the film. Didn't the President have a daughter that we could have rather than a nephew? And why not have it be Smith's stepchild? Although I think we may discover that it actually is that character. What about Russell Casse's (Randy Quaid) kids? Why not just call it Independence Day: The Next Generation and go whole hog on the innumerable second generation that were in the first movie? It'll be a trip.